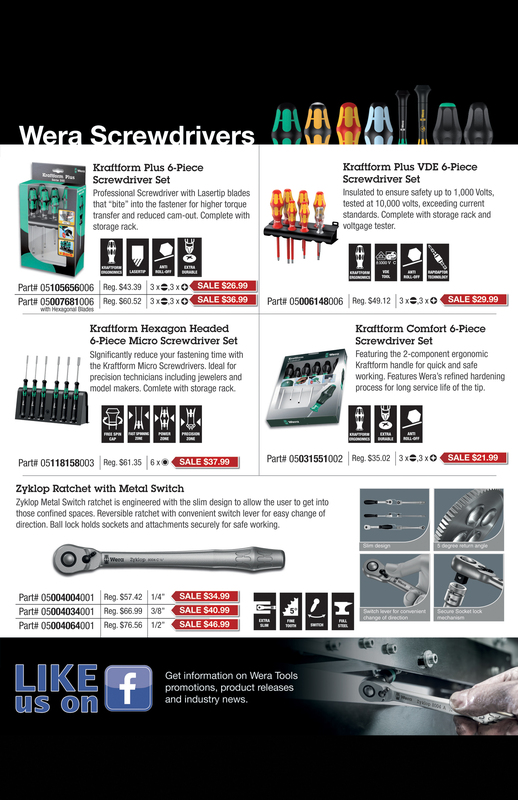 Fall is in full swing and to mark the occasion what better than a sale on select Wera Tools? From now until December 31st, 2015 you can take advantage of additional savings on featured Wera Tools including the popular Zyklop Ratchet with Metal Switch range. Plus, there is free shipping on $50+ continental USA orders. Keep “Rust at Bay” with Wera Stainless Screwdrivers Sets. Using a non-stainless tool on a stainless fastener can result in microscopic bits of metal being left behind on the fastener which when left out in the elements can lead to rust on “stainless” fasteners. Historically the metallurgical properties of a stainless tool steel have compromised its strength — making it more brittle and prone to premature wear (or failure). Through a proprietary vacuum ice-hardening process Wera has created a stainless steel tool with the hardness and strength for any industrial application. 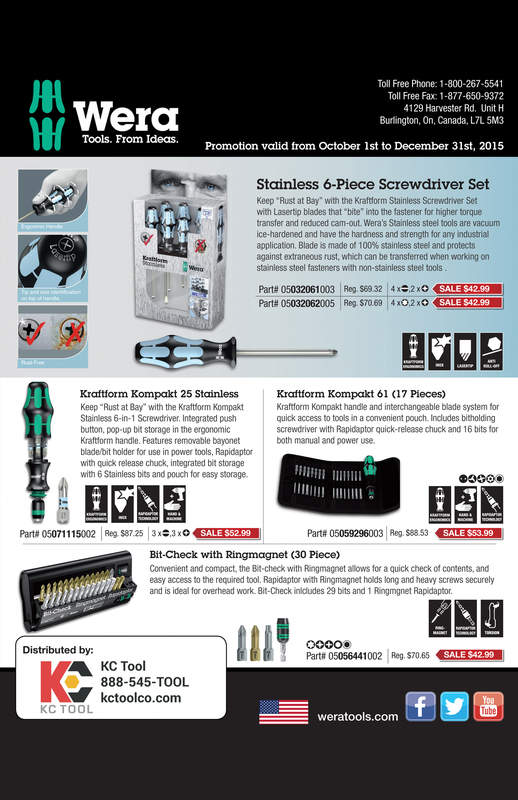 There are also great deals on non-stainless sets such as the interchangable blade system found in the Kraftform Kompakt 61 set which encompasses many of the “security” tip styles and sizes (Spanner, Tri-Wing, Torq-Set, Security Torx). Be sure to check out our other Sale Items, New Arrivals, and Tool of the Day. Please contact KC Tool if you have any questions.